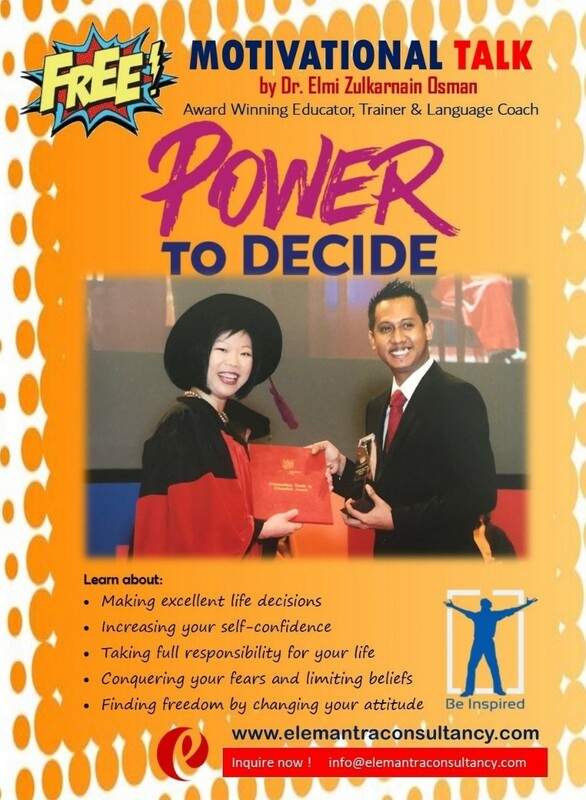 Dr. Elmi Zulkarnain Osman is one of the most highly sought-after overly humorous motivational speakers from Singapore. Whether speaking to a few coworkers or an auditorium of hundreds, Dr. Elmi has been gaining a lot of attention as a motivational speaker in his home country and South East Asia. After 15 years in the public service and graduating with a Doctorate in Education from TUI, he decided to become an entrepreneur. Currently the CEO of his own training consultancy, Dr. Elmi has been well sought after as a trainer that inspires his course participants through his humorous approach. On the side, he has been giving free motivational talks to grassroots organisations, youth organisations and volunteer groups. His talks titled "Power To Decide" were so well received that he was invited to talk to senior executives of many top companies in Singapore and South East Asia. When he was interviewed, he simply described his his motivational talk as a sharing about the “concept of IMPACT”. He just wanted to tell the world his story. I wanted to show people aspirations are achievable, great things are possible and anyone can share a positive message and create a life of meaning. All the best to Dr. Elmi! "Dr. Elmi Zulkarnain Osman was an energizing force, fabulous to have him motivating our team. He was uplifting and we loved his critical message of resilience." "His content is personal and deep; he provides information from Cognitive Behavioral Psychology and Positive Psychology which is useful in day to day living, business leadership, and especially for those who serve others." "Using humour and transformational energy, our group found Dr. Elmi profoundly motivating and inspiring. Dr. Elmi "held the room" for a full day, inviting lots of discussion, building hope among in our industry during the most difficult time. I recommend Dr. Elmi to any group.